'Bankers build their careers on trust, or so everyone thinks, till a series of murders threaten to destroy the reputation that the Greater Boston Global Bank (GB2) has built over the years. Who is behind these killings, and what is their motive? Is the banker at GB2 fast turning into a bankster? Or was he always one? 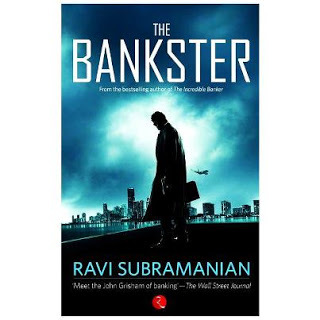 When Karan Panjabi, press reporter and ex-banker, digs deeper, he realizes that he has stumbled upon a global conspiracy with far-reaching ramifications – a secret that could not only destroy the bank, but also cast a shadow on the entire nation. With only thirty-six hours at his disposal, he must fight the clock and trust no one if he is to stay alive and trust no one if he is to stay alive and uncover the truth. The story begins in Angola where a covert CIA agent supplies arms to rebels, with the help of DR Congo and is paid in diamonds, in exchange. The author then, takes us immediately to Kerala in southern India, where an elderly man, who lost his son and daughter-in-law during the Chernobyl disaster, is leading a protest against the Trikakulam Nuclear Power Project (based on the ongoing Koodankulam protest). The author then takes us to Mumbai, which could be said as the main plot, where a foreign bank in India, Greater Boston Global Bank (GB2), many of whose officials are losing their lives – murdered, in fact. Why these officials, that too from these particular bank? Karan Panjabi, a journalist and a former employee of GB2, investigates the case, leading him to drastic findings, which could absolutely destroy the bank's reputation. I judged a book by the summary written in the back of the book by the publisher, considering the global nature of this book, with the author taking the reader to Angola, Kerala, Mumbai, Vienna and Tel-Aviv; and also dealing with a white-collar crime, I decided that I'm certainly going to like this book. Fortunately, I wasn't disappointed. It was a fast moving story – a story with three parallel plots and I liked the way in which the author brought out how actually works, supposed to serve the customers, but instead, how the employees are desperate only to achieve their targets for personal gains and in order to achieve such targets, how the coerce the customers into their devious schemes. The book would be best enjoyed if read in 2012 or 13 mainly because you could easily relate to the events happening around you. The author also maintained the suspense till the very end with twists and several red-herring characters (could have been better if 'solve before the detective' had been possible, in my opinion, even if you happen to guess things right, you can only thank your instinct). As a light note, I also loved the chapter where he imitated Arnab Goswami and his Newshour Debate. But coming to the other side of it, I didn't like the overuse of Hindi in conversation. Words like chai being tea are known to most Indians but there were whole sentences were in transliterated Hindi; which isn't a problem for someone who knows the language but would certainly be a problem for the huge non-Hindi speaking population who read English novels. Perhaps the author justifies it as recreating the exact Mumbai atmosphere but that is something that could have certainly been avoided. Another thing about this book is the poor character building and also, there is no character to whom a reader can attach herself / himself to while reading the book; although we know that Karan is the protagonist (if you've read the publisher's write-up), still, at the outset, it seemed as though the Retail head of GB2, Vikram was going to be the main character and then the attention shifted to Nikhil, the cluster head, and then, Anand, the manager of the branch in Bandra, Mumbai and then it seemed like a battle between the two relationship managers of the Bandra branch, Harshita and Zinaida and after that Raymond, a manager of the compliance department of the bank gained prominence and finally, only around the 200th page (in a novel of 358 pages), Karan was actually involved in a conversation. It certainly would be a page-turner for those love to read any form of thrillers. My important benchmarks for being a good thriller, the plot, the pace and a fitting end, were all met in this book which allows me to award this book a seven on ten.